Home to the world’s largest man-made whitewater river and an official Olympic Training site, the U.S. National Whitewater Center (USNWC) is an outdoor enthusiast’s dream, showcasing endless ways to explore by air, in water and on land. Encompassing 1,300 acres that run along the banks of the Catawba River, the outdoor facility boasts multiple zip lines that will have you clutching your harness as you glide through the air. Overcome your fear of heights by conquering the 60-foot or 100-foot free fall jump. Or put your strength to the test as you travel from platform to platform through the canopy of trees in one of eight ropes courses. Olympic hopefuls flock to the professional-level rapids to train in whitewater slalom racing. The USNWC was the site of the canoe and kayak slalom trials for the 2008, 2012 and 2016 Summer Olympic Games. Some giants of the sport, like Mount Holly resident Casey Eichfeld, even moved to the Charlotte area to be closer to USNWC before competing for their shot at gold. But those without Olympic dreams will still find adventure and thrill aboard the guided whitewater rafting course, which bills experiences to fit every skill level. Walk down a short trail to access the Catawba River, where stand-up paddleboarding and single and tandem kayaking await. On land, the USNWC offers more than 30 miles of trails for running, walking and biking. The center is also home to one of the largest outdoor climbing walls in the South; at its max, it reaches 30 feet. For those itching for a new challenge, the USNWC features the world’s first permanent Deep Water Solo Climbing complex. Climbers scale an arched wall without ropes or harnesses, then release themselves into a 20-foot-deep pool. We sought unmistakably Charlotte experiences and found them in these popular locales. Here are six experiences exclusive to the Queen City. What makes a city unique? Man-made wonders offer adventurers and city explorers unparalleled attractions, while hometown spirit—especially the spirit of discovery—often lays the foundation for a metropolis’ future. Conquer the twists, turns and drops aboard the world’s tallest and fastest giga coaster: Fury 325, the 2016 winner of Amusement Today’s famed Golden Ticket Award for “Best Steel Coaster.” Thrill-seekers climb to a towering 325-foot peak—the city is visible in the distance—before dropping sharply at a hair-raising 81 degrees. Seated on the North Carolina and South Carolina state line, Carowinds amusement park is the intersection of family fun and adventure. From record-breaking coasters to unique live shows, the “thrill capital of the Southeast” has maintained exclusive bragging rights since it opened in spring 1973. The park is also home to Plants vs. Zombies Garden Warfare 3Z Arena, the world’s first “intra-active” 3-D digital experience, meaning the game allows you to interact with an opponent’s screen. During this shooter video game, guests on opposing teams—plants or zombies—battle it out to capture the ultimate treasure: the Golden Gnome. Alongside these whirling additions, you’ll find a host of Carolina callouts in tried-but-true and new rides alike. 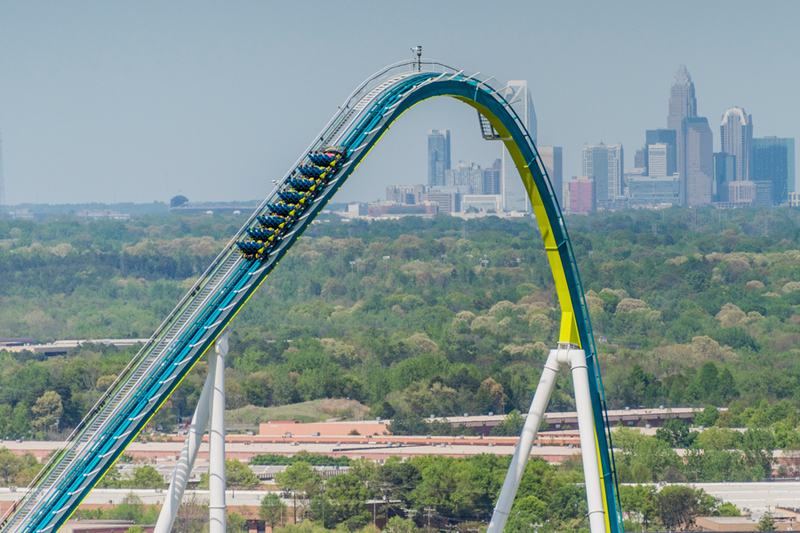 With a hurdling track that seems to dive and soar like a fury of bees, Fury 325 serves as a nod to Charlotte’s “hornet’s nest of rebellion” reputation. The Carolinas Goldrusher—complete with carts designed like mine trains—hugs turns to mimic the excitement that swept the Charlotte region during the nation’s first gold rush. The sprawling Carolina Harbor waterpark, the largest waterpark in both states, exudes the characteristic charm of the Carolina Coast. Tidal Wave Bay’s 400,000-gallon wave pool mimics the surf of the Atlantic, while Blackbeard’s Revenge, named for the infamous Tar Heel State pirate, boasts a harrowing six-story waterslide complex. In spring 2017, the park added the County Fair attraction, which combines vintage rides, classic festival fare and hearty doses of nostalgia to recreate the feel of an early-era Carolina carnival. Keep your calendar clear: Every season and every day in Charlotte brings something new and exciting. Heated sports battles, chart-topping entertainers and colorful city celebrations are all on the books.